Hot Cross Buns are traditionally served on Good Friday. 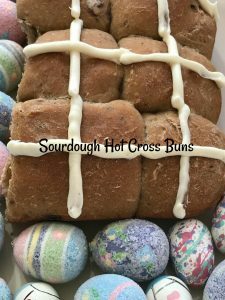 They are a spiced, sweet bun and each bun is marked with the shape of a cross to symbolize Christ’s suffering and crucifixion. Usually made from scratch but if that’s not possible, they can be picked up at most local bakeries. I was brought up Catholic and we had the usual Catholic Easter traditions while growing up, but I don’t ever recall eating a hot cross bun. 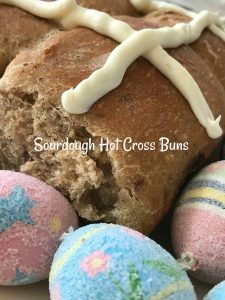 After doing some research and looking at different recipes for hot cross buns, I realized why we never experienced the delicious hot cross bun. Recipes for Hot Cross Buns were much to difficult for Aggie to attempt. Aggie never made homemade yeast bread, dinner rolls or cinnamon rolls. Aggie made banana bread at Christmas but that was it. I don’t think Aggie ever used yeast nor knew what yeast was used for. All of our bread came from Mrs. Karl’s Bakery Outlet. Back then, I think you could buy six loaves for $1.00. 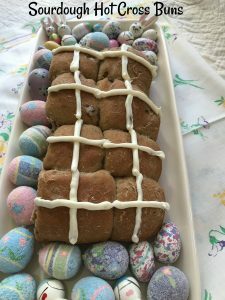 Aggie’s version of Hot Cross Buns were the kind you “browned and served.” I guess if you looked closely on the top, brown and serve rolls “sort of” have a cross on the top of them…that might be stretching it a bit but it sounds good! Anyway, Hot Cross Buns are really very delicious. The Hot Cross Bun is the most famous and probably the oldest, of the many English buns. Today Hot Cross Buns are eaten throughout Lent but Hot Cross Bun was originally eaten only on Good Friday. Father Rocliff, a monk and the cook of St. Alban’s Abbey in Hertfordshire, gave each poor person who came to the abbey on Good Friday a spiced bun marked with a cross and the usual bowl of soup. The custom was continued and soon spread throughout the country. Hot Cross Buns became enormously popular in England in the eighteenth and nineteenth centuries. I dug a little deeper into this tradition and found this excerpt from Father Francis Weiser in Handbook of Christian Feasts and Customs. It was a universal custom and still is to mark a new loaf of break with the sign of the cross before cutting it. This was done in order to bless the bread and thank God for it. 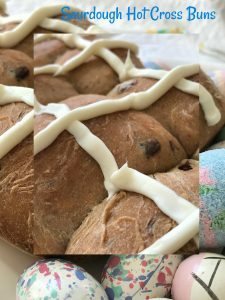 On special occasions, the cross was imprinted on the loaf before baking, as on the Christmas loaves in southern France and in Greece, the Kreuzstollen (cross loaf) in Germany and the cross bread of Mid-Lent among the Slavs. On Good Friday, loaves bearing an imprinted cross (Karfreitaglaib) are eaten in Austria. Many people believe that devout Christians of that time, especially those in Ireland who often observed a Black Fast, taking only water or tea during the day on Good Friday, would break the fast to eat a bun with icing. It seems more plausible that the hot cross bun would be marked with the cross before baking as those from Saint Alban’s Abbey. So it seems to suggest that the cross was originally scored in the top of the bun with a knife and that the icing cross was a modern decorative feature. 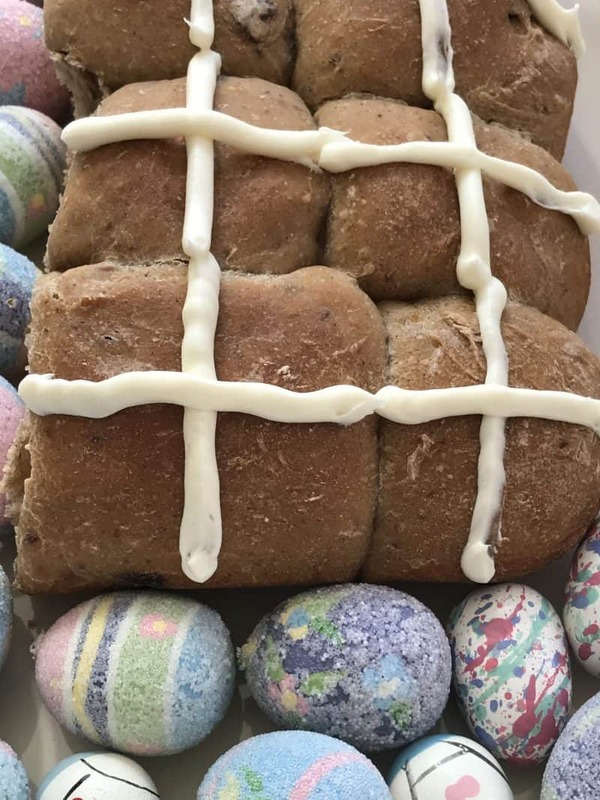 Others feel that if Hot Cross Buns are eaten on Good Friday, the cross should be scored into the top of the bun with a knife and if Hot Cross Buns are to be served on Easter, the buns can have an icing cross on the top. Delicious hot cross rolls with the pleasant tang from the sourdough. Place the sourdough starter, flour, zests, sugar, and spices in a large bowl or in the bowl of an electric mixer. Lightly beat the eggs with the honey, milk and water, then add to the sourdough/flour mixture. Mix until completely combined and a very sticky dough has formed. Cover and let sit for 20 minutes. Mix in the fruit and the salt. The dough will be a rather wet dough, but resist the urge to add more flour. Knead until the dough begins to look smooth and shiny, about 20 minutes by hand or 10 minutes with the mixer. Add in the cubes of butter, one at a time. The kneading action will incorporate it and create a rich dough. Knead until all the butter is fully incorporated, once again resisting the urge to add more flour. Remember too little flour is better than too much flour! The final dough should be very soft, but not at all sticky. Place the dough in a lightly oiled bowl and let it sit for 1 hour. After an hour, punch it down gently by folding it over on itself a number of times on a floured board, then place it back in the bowl to rise another hour. Divide dough into 24 pieces and shape each into a small roll. Place rolls in a buttered 9×13 baking dish, close but not quite touching. Leave at room temperature until doubled, about 2-4 hours. Bake in a 375 degree oven for 20-30 minutes until the rolls are golden. Cool rolls on cooling rack, when rolls are cool, make powdered sugar frosting. In a small bowl combine 1 cup powdered sugar and 2 tablespoons milk until reach desired consistency. Make crosses on rolls. Serve on Easter.